NASA has launched OSIRIS-REx spacecraft to collect samples from an asteroid 101955 Bennu and return to Earth. What will the OSIRIS-Rex do? As part of this, the asteroid will be mapped using instruments on the probe, in order to select a suitable site for samples to be collected from. Paper 2 Topic: Structure, organization and functioning of the Executive and the Judiciary Ministries and Departments of the Government; pressure groups and formal/informal associations and their role in the Polity. The Supreme Court has agreed to lay down the law on whether the Lieutenant Governor (LG) of Delhi can unilaterally administer the National Capital without being bound by the “aid and advice” of the elected government. This decision was announced by the court in the context of prolonged Centre-Arvind Kejriwal turf war over who controls Delhi as an “extraordinary matter”. The Supreme Court has refused to stay the HC judgment, despite submissions by Delhi government that the verdict “affects all future governments and all future relationships between the Centre and the State”. The HC had upheld the LG’s power not only over the police, land and public order but also in “services”. The judgment had effectively shrunk the Delhi Cabinet’s girth. The 1996 judgment by the Supreme Court in North Delhi Municipal Corporation versus State of Punjab clearly terms Delhi as a Union Territory in a class by itself. The judgment observed that “the Union Territory of Delhi is in a class by itself but is certainly not a State”. Union territories are in different stages of evolution. Union Territories are governed by Article 246 (4) of the constitution notwithstanding the differences in their respective set-ups. Paper 2 Topic: Awareness in the fields of IT, Space, Computers, robotics, nano-technology, bio-technology and issues relating to intellectual property rights. With Geosynchronous Satellite Launch Vehicle (GSLV-F05) mission’s recent success, ISRO has signalled the country’s readiness for Chandrayaan II mission, which will be India’s second mission to the moon. Chandrayaan II is an advanced version of the previous Chandrayaan-1 mission. It consists of an orbiter, lander and rover configuration. The wheeled rover will move on the lunar surface and will pick up soil or rock samples for on-site chemical analysis. The data will be relayed to Earth through the Chandrayaan-2 orbiter. According to an estimate by the ICRA, the country’s microfinance sector will grow nearly three-fold to reach up to Rs 4.3 trillion over the next three years on account of expansion into newer segments and enhanced average loan sizes. The estimate includes micro credit across self-help groups, microfinance institutions and banks. If the ticket sizes were to double from the current levels over the next 3-4 years and MFIs were to increase their presence in under-penetrated areas, the microfinance market could reach Rs 3.3-4.3 trillion over the next 3 to 4 years. The assumption on the doubling of ticket sizes is based on improving income levels, inflation, higher eligibility of borrowers moving to higher loan cycles. The MFI sector, excluding Bandhan Bank and teh SFBs, will need external capital of Rs 16-47 billion over the next three to four years. While the business opportunity is exciting, there is a need for establishing a credit culture in the new geographies and strengthening the credit appraisal processes. The two operational credit bureaus have helped the sector maintain its asset quality. But there are a few issues yet to be addressed like limited coverage of SHG bank linkage programme data, issues related to multiple identity cards being used by borrowers for availing loans from more than two MFIs and interlinking of retail credit. The overall stress of credit which is due for more than a day stood at 0.35% as of March 31, 2016, helped by regulatory decisions like data sharing through credit bureaus, cap of Rs 1 lakh for overall borrowing and the stipulation for not more than two MFIs to lend to a single borrower. However, “communal and political” incidents in Madhya Pradesh, Uttar Pradesh, Bihar, Jharkhand and Karnataka did lead to some pressure on asset quality. However, the sector remains vulnerable to asset quality shocks owing to the risks associated with unsecured lending business, political risks, and operational risks arising out of cash handling. The Indian microfinance institution (MFI) sector grew 40% in 2015-16 to Rs 1.4 trillion as against a 38% growth in the previous fiscal, while the average ticket sizes were Rs 20-25,000. Majuli: It has become the first island district of India. It is the 35th district of Assam. Recently, Majuli entered the Guinness Book of World Records as the world’s largest river island. Two world records by Indian Army: Two Indian Army soldiers have created world records for longest continuous motorcycle ride by standing on the seat and handle bar riding. Captain Manpreet Singh covered 75.2 km in two hours, 24 minutes and 12 seconds standing on a motorcycle seat. The previous world record of 32.3 km was achieved by Ratnesh Pandey in Indore on December 5, last year. The World Record for handle bar riding on a bike under fresh category was established by Havildar Sandeep Kumar, covering 46.9 km in 1 hour, 27 minutes and 31 seconds. 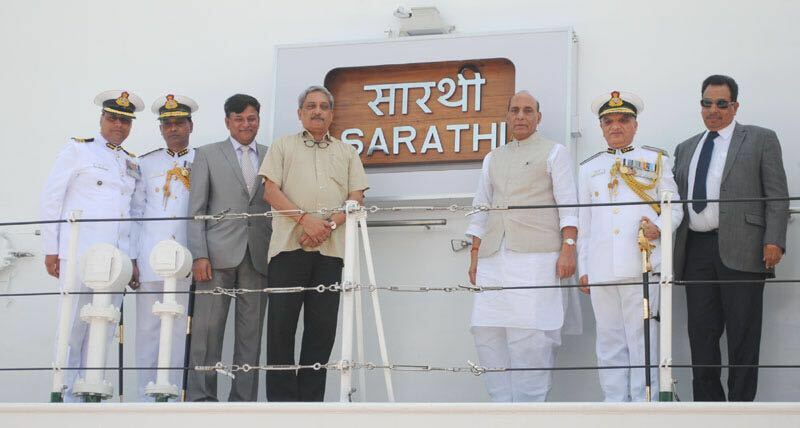 Sarathi: It is an Indian Coast Guard Ship commissioned recently. It is the third ship in the series of six Offshore Patrol Vessels (OPV). ‘Sarathi’ meaning charioteer is a projection of Indian Coast Guard’s will and commitment ‘To serve and protect’ the maritime interest of the nation. It has been designed and built indigenously by GSL and is fitted with most advanced state-of-the-art navigation and communication equipment, sensors and machineries. The ship is designed to carry one twin engine Light Helicopter and five high speed boats including two Quick Reaction Inflatable Boats for swift boarding operations, search and rescue, law enforcement and maritime patrol. The ship is also capable of carrying pollution response equipment to contain oil spill at sea. Previous story AIR spotlight summary on Tax on Junk Food.